Cell stretcher. Schematic representation (A) and photographic image (B) of the cell stretcher device. Cells were plated on an elastomeric PDMS-membrane coated with the extracellular matrix–protein fibronectin. The cell stretcher was attached to an inverted microscope to observe cell behavior during uniaxial, cyclic stretch. The membrane was stretched up to 30% by a linear motor. Many cell types in our body are subjected to deformation or mechanical forces. These mechanical signals play important roles in many fundamental cell functions, exert multipe effects and thereby regulating important processes. In order to investigate the mechanical response of cells to uniaxial stretch we use a cell stretching device wich was kindly given by the Forschungszentrum Jülich. 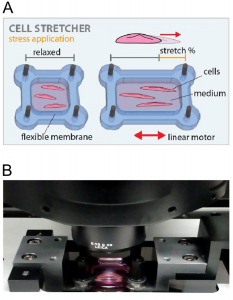 Cells are seeded on an flexible PDMS-membrane and are stretched by a stepper motor wich is connected to one side oft the chamber. This is possible in both a two-dimensional and three-dimensional environment.